Pests are a common problem in any garden. All gardeners face this issue at least once, and many of them can’t seem to get rid of pests no matter what they try. It’s true that some gardens attract more pests than the others, but it’s important to know that no matter how much your garden is affected, there is still a lot you can do to eliminate this problem. What you need to remember that pest control is a chore of its own, and it demands time and effort. Not to mention that you should take some precautions. Natural pest control saves the environments as well as your plants, so you should definitely consider it. It brings numerous advantages to gardeners, but it also requires a bit more time and effort than simply pouring a commercial insecticide over your plants and hope for the best. What is Natural Pest Control? Defending your garden against pests can take many forms, and natural pest control is no different. The choice of methods and your success will largely depend on various factors, such as you location, plants you grow and crop varieties, climate conditions, time you have to dedicate, and more. Pest control requires a lot of time, patience, and a lot of trial and error. You need to be prepared for this so you can fight pests with success. Keep in mind that eliminating pests from your garden is a work of its own and you need to dedicate energy to it. There are many pests you may face in your garden, from various bugs to slugs and birds. Any garden can provide a great place for numerous pests who want to eat your plants or hide under them. The first instinct you might have when you discover pests in your garden might be to buy a first strong insecticide you can find and destroy the pests. However, these chemical-intensive measures are rarely a good way to go. You may try to destroy pests with all these herbicides and pesticides, but these chemicals will harm more than just pests: they will also kill many beneficial organisms that are helpful in your garden. Not to mention that these chemicals will harm your plants and endanger your family and pests. These products are also very harmful to the environment. Another problem is that these pesticides, herbicides and other products are typically petroleum-based, which means they require a lot of resources to produce. It is another attack on the environment. Not to mention that you will need to use them over and over again in order to treat the problem. Typically, these chemicals need to be reapplied in order to combat the pests effectively. Some pests have even became “superpests”, which means they have the ability to withstand a chemical dousing. These are just some of the reasons why you should forget about chemicals and turn to natural pest control instead. Natural methods are effective and they keep your plants, family, pets and environment healthy. These methods also keep the beneficial organisms and animals you wish to have in your garden. Here are some universal tips for those who wish to try safe, natural alternatives to chemical pest control. First of all, you need to make sure that your plants are strong and healthy. 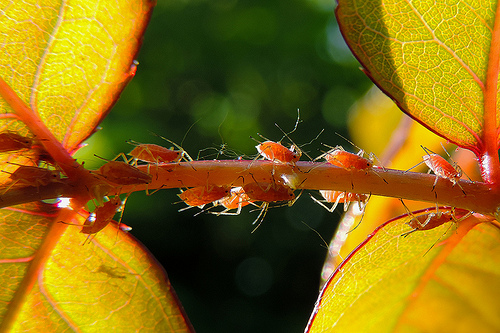 You need to discourage pests from visiting your garden and attacking your plants. If your plants are strong and healthy, it will be more difficult for pests to attack them. In order to achieve this, cut all weak or infected plants. Make sure to dispose them somewhere away from the garden. In order to improve your plant’s health, use organic compost, mulch and natural fertilizers such as seaweed and animal manure. They all have trace elements such as zinc, calcium, sulfur, barium and magnesium. All these elements are vital for plant development. It’s also important to note that these elements are also repellent for some insects, so it’s another line of defense. Another thing you should do is to clear leaf litter and weeds from your garden. This will eliminate many pest habitats. Spread clean mulch instead. In order to prevent plant-specific infections, interplant with companion plants and rotate your crops each year. This will eliminate some of the most common problems. You should also encourage beneficial insects in your garden. They will keep pest population low. To avoid fungal and insect damage, always make sure to water early in the morning and not in the middle of the day. It’s important to understand that pests largely vary from garden to garden. However, there are some very common pests you can find almost anywhere. • Aphids. Ways to combat them: insecticidal soap, horticultural oil, attracting beneficial insects. • Armyworm. Combat them with row covers and handpicking. • Asparagus beetle. Combat with poultry predation, neem and handpicking. • Blister beetle. Combat with poultry predation, neem and handpicking. • Cabbage root maggot. Ways to combat: crop rotation, beneficial nematodes and diatomaceous earth. • Cabbageworm. Combat with row covers and handpicking. • Carrot rust fly. Combat using crop rotation, beneficial nematodes and diatomaceous earth. • Colorado potato beetle. Combat using poultry predation, neem and handpicking. • Corn earworm. Combat using horticultural oil and beneficial nematodes. • Cucumber beetle. Ways to combat are poultry predation, neem and handpicking. • Flea beetle. Combat with insecticidal soap, garlic-pepper spray and row covers. • Harlequin bug. Combat with handpicking, good garden sanitation and neem. • Japanese beetle. Combat using handpicking, row covers and milky spore disease. • Mexican bean beetle. Combat using poultry predation, neem and handpicking. • Onion root maggot. Ways to combat: crop rotation, beneficial nematodes and diatomaceous earth. • Slugs. Combat with handpicking, iron phosphate slug bait and diatomaceous earth. • Snails. Combat using handpicking, iron phosphate slug bait and diatomaceous earth. • Squash bug. Combat with handpicking, good garden sanitation and neem. • Squash vine borer. Combat using growing resistant varieties, crop rotation and beneficial nematodes. • Stink bug. Ways to combat: handpicking, good garden sanitation and neem. • Tarnished plant bug. Combat using handpicking, good garden sanitation and neem. • Tomato hornworm. Combat using handpicking and row covers. • Whitefly. Combat with insecticidal soap, attracting beneficials and horticultural oil. • Cutworm. Combat with rigid collars and diatomaceous earth. We have lost all our tomato plants in our greenhouse by that asian moth.